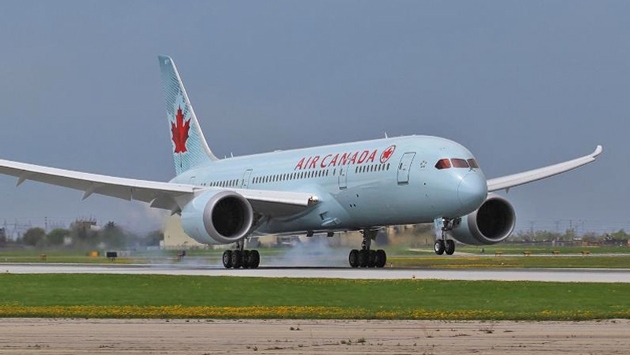 Air Canada customers flying AC005 from Toronto to Tokyo-Haneda made history today as they boarded one of the airline's brand new Boeing 787 Dreamliners now operating Air Canada's first new scheduled route with the ultra-modern, fuel efficient aircraft. "We are delighted to introduce our customers flying between Toronto and Tokyo-Haneda to Air Canada's new international standard for comfort on our state-of-the-art Boeing 787 Dreamliner," said Benjamin Smith, executive vice president and chief commercial officer. "Feedback from customers who have flown on our Dreamliners has been extremely positive particularly with respect to the comfort and spaciousness in all three cabins, our newest enhanced definition seat back touch screen in-flight entertainment, the quieter, smoother ride and the technological advancements providing a more refreshing feel at the end of the journey. "We look forward to deploying the Boeing 787 Dreamliner on our Toronto to Tel Aviv route later this summer, and on our Vancouver to Tokyo-Narita and Shanghai routes this coming winter." Air Canada launched Tokyo-Haneda service on July 1 using a Boeing 777-300ER aircraft and its transition today to Boeing 787 Dreamliner service makes it the airline's first scheduled route for the new aircraft. The Boeing 787 Dreamliner aircraft features a brand new contemporary décor and three cabins of service, International Business with 180-degree lie-flat pod seating, Premium Economy and Economy. It also offers an extensive choice of in-flight entertainment on enhanced-definition, seat-back touch screens along with power outlets and USB ports available for all customers. Visit 787.aircanada.com for full details and a virtual tour of the aircraft and its cabin amenities. Air Canada's Dreamliner fleet will consist of a total of 15 Boeing 787-8 aircraft and 22 of the larger capacity Boeing 787-9 aircraft. All 37 Boeing 787 aircraft are scheduled to be delivered by the end of 2019. As Air Canada takes delivery of new widebody aircraft for its mainline fleet, current Boeing 767 and Airbus A319 aircraft will be transferred to its leisure carrier subsidiary, Air Canada rouge.